Sixty thousand manufacturing jobs were added in the U.S. in 2014, versus 12,000 in 2003, either through so-called reshoring, in which American companies bring jobs back to the U.S., or foreign direct investment, in which foreign companies move production to the U.S., according to a study from the Reshoring Initiative. 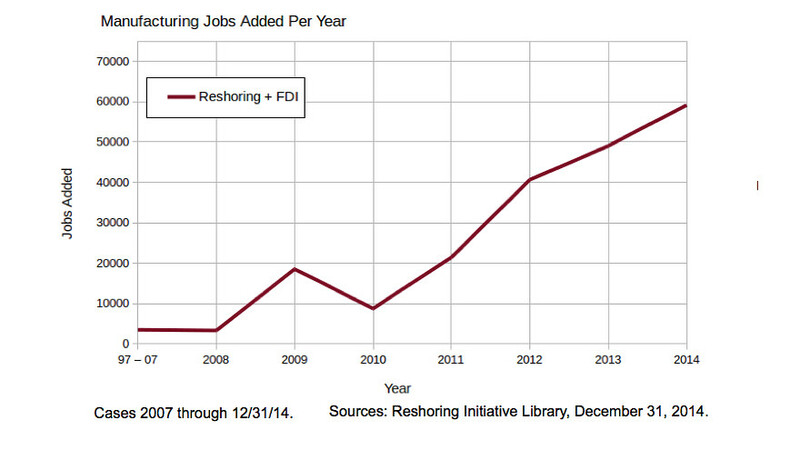 In contrast, as many as 50,000 jobs were “offshored” last year, a decline from about 150,000 in 2003. One big catalyst behind the trend: Escalating wages in traditionally lower-cost countries, including China, have pushed companies to reconsider sourcing strategies. To meet consumer demand, companies increasingly want to make products closer to where their customers are and react to trends and ship faster. Additionally, there are shipping costs and import duties to contend with when a company manufactures the products that it intends to sell into the U.S. market overseas. Meanwhile, such variables as environmental issues, product-quality scandals, and incidents like the 2013 Bangladesh garment-factory collapse or this year’s West Coast port slowdown have made domestic production more appealing. Government incentives and a relatively skilled U.S. workforce are also among top factors. In fact, among the world’s top 10 export economies, the U.S. last year ranked No. 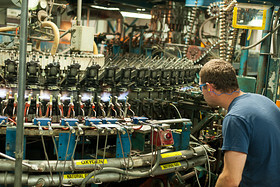 2 — behind only China — for cost competitiveness, according to the Boston Consulting Group, with real estate and natural gas and other energy prices tending to apply downward cost pressure in the U.S.
Patriotism and the pursuit of positive corporate images as standing behind the U.S. economy is another factor for companies opting to bring manufacturing stateside. A 2013 Gallup poll found 45% of Americans saying they had made a special effort to buy U.S.-made products. The survey showed 64% said they would be willing to pay more to buy a U.S.-made product than a similar item made overseas. 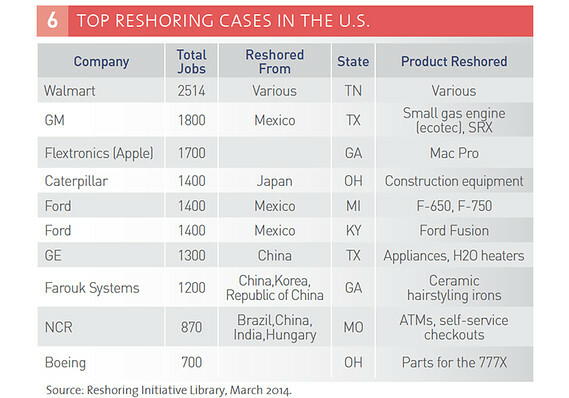 Retail giant Wal-Mart Stores Inc. is a key driver of the trend, the Reshoring Initiative’s study showed. Wal-Mart in early 2013 said it would buy an additional $250 billion in U.S.-made products over the next 10 years. General Electric Co. is one supplier that has taken up Wal-Mart’s call to make more energy-efficient light bulbs domestically; Wal-Mart sells a GE bulb line exclusively at its stores. Boston Consulting Group estimated Wal-Mart’s move could create up to 1 million direct and indirect American jobs. On Wal-Mart’s website, there’s a special section displaying its “Made in the U.S.A” products. Wal-Mart has said that creating jobs in the U.S. makes economic sense in that it boosts the spending power of its customers. “Our model suggests the U.S. can offer very competitive manufacturing options, especially given many rising cost variables overseas,” according to a Wal-Mart statement on the initiative. The company pointed to 500 “active initiatives” involving product categories as diverse as tires, bicycles, home textiles, toys and cookware. In addition to its light-bulb deal with Wal-Mart, GE has brought back the manufacturing of some appliances and water heaters, the Reshoring Initiative reported. Among other companies getting in on the emergent reshoring trend, for instance, has pledged a Made in the U.S.A. push through which it aims to produce Mac Pro personal computers on U.S. soil. CEO Jeff Immelt of GE has said the U.S., on a relative basis, has never been more competitive. For instance, he’s said it takes three hours or less to make a refrigerator, so the total cost can be lower to have it made domestically versus in China or Mexico when factoring in other costs including transportation. And it’s not just hard goods. Fashion is also a key reshoring industry. Brooks Brothers, which also has a website section touting U.S.-made clothing and accessories, has told MarketWatch it’s increased the percentage of its merchandise that is domestically sourced. Producing domestically also means manufacturers don’t have to commit to outsized orders. Lingerie designer Cosabella, whose products are sold at retailers including Nordstrom Inc. for the first time last fall began making lounge and sleep wear in Los Angeles that was previously being made in Italy and Peru, CEO Guido Campello told MarketWatch. We’ve been “able to hit the relative market price points and have much less production minimums to deal with when compared to producing in Peru,” he said. As to foreign companies manufacturing in the U.S., BMW is one prominent example. Its Greer, S.C., car-assembly plant, with more than 7,000 employees, makes it one of the biggest employers in that state.